WestJet has dropped the price of their non-stop flights from Vancouver to Honolulu, Hawaii in September down to $394 CAD roundtrip including taxes. To be honest September flights to Honolulu haven't been priced *that* much higher than this for quite a while now ($425 to $450), but this slight price drop has officially put them into the $300s roundtrip, which hasn't happened in a while. And everyone does love Hawaii. It's easy to forget how competitive fares from Canada to Hawaii have become in the last few years. The price will show up as $307 USD roundtrip including taxes, which will work out to $394 CAD when booked using a Canadian credit card, and including the typical credit card foreign exchange fee. You can also find non-stop flights with Air Canada Rouge for $12 more in September. And $40 more in January/February. 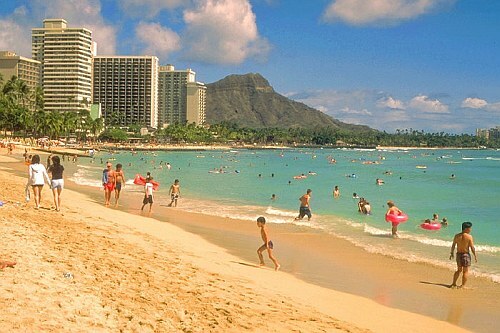 vancouver, yvr, flight deals, honolulu, hawaii, hnl, westjet, united states and north america.